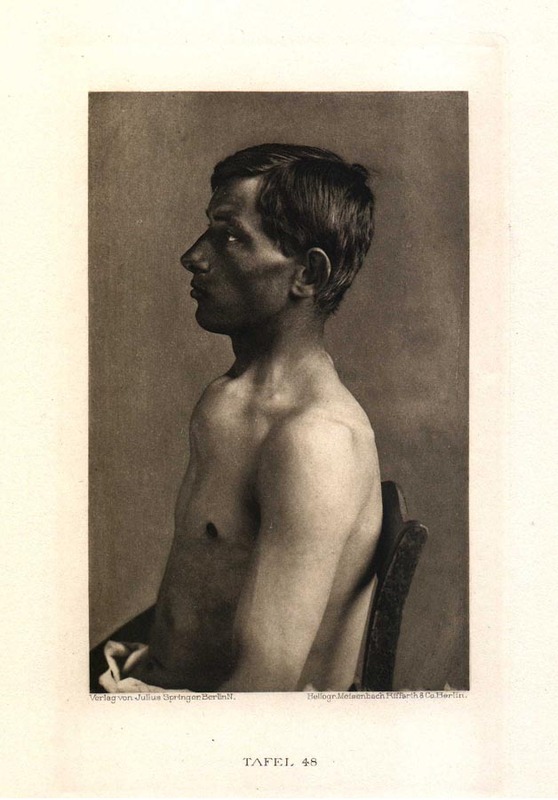 The photographic session for Plate 48 was at the time of admission of the patient into the clinic, and continued in Plate 49 when the malady was further advanced. The still smooth rotund tumor which emerges in the first picture had grown even more in height and breadth in the second, considerably humplike, the over stretched skin ulcerous in various places. The tumor, confined almost exclusively within the region of the manubrium sterni, was obviously coming out from below its surface. 19 year old previously thriving healthy country man. Cause of the affliction quite unknown. Extremely rapid course for this kind: 7 to 8 weeks from the first scarcely noticeable appearance on up to death. Sectioning proved further metastases in the lymph nodes, lungs and pleura, as well as in the liver.